The My Girl diamond is the perfect balance of fire, brilliance, and scintillation. The eight-sided, square cut diamond was designed by Yair Shimansky after three years of intense research and development. The breathtakingly beautiful My Girl diamond is the first internationally patented diamond to originate from South Africa, and after 15 years, remains sought-after for its beauty, and for the originality of its cut and design. The My Girl diamond is truly ahead of its time. The My Girl design is inspired by the woman of your dreams and designed with perfection in mind. Each element of the My Girl is influenced by the way in which light reflects from the diamond; creating a sparkle with every move she makes. When it comes to the My Girl diamond she remains the true inspiration, each and every day. View our one-of-kind My Girl diamond collection for unforgettable diamond jewellery for her and exclusive jewellery gift ideas. After 15 years the My Girl diamond still remains one of the most exquisite diamond cuts of all time; the My Girl is the world’s first square cut diamond with a diamond-shaped table. 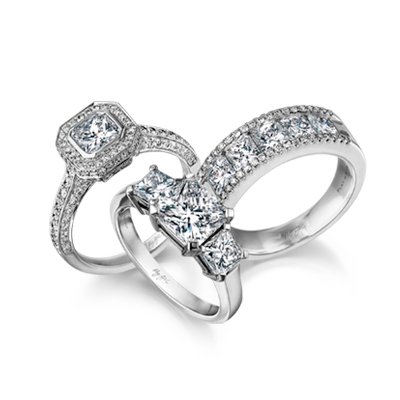 The diamond cut requires a skilful eye of an experienced craftsman and master diamond cutter. The Shimansky craftsmen have mastered a unique way to transform a rough diamond into a square cut diamond like no other. Unlike any other square cut diamond with sharp corners, the My Girl has four sides with cut corners. This unique diamond design makes it ideal for the extraordinary and one-of-a-kind jewellery settings, Shimansky has to offer. The cut ensures that light is evenly distributed throughout the diamond, unlike princess cut diamonds that pull darker light to the corners. "As much as 50% of a rough diamond is lost in the cutting and polishing process of the My Girl diamond," Shimansky says. Unforgettable and timeless, the beauty of the My Girl diamond will take her breath away. The captivating diamond cut is the perfect way to remind her every single day of the love you share. Let her sparkle with every move she makes! The My Girl diamond is the essence of romance and beauty. This original, eight-sided, square cut diamond was pioneered 15 years ago by Yair Shimansky after three years of research and development and carries an international patent for its cut and design. The My Girl diamond is truly remarkable. After 15 years of marriage, she still looks at her extraordinary diamond ring with so much love and appreciations. For her, the My Girl still brings her so much joy. "My Girl brings a smile to my face. My Girl brightens up my day. My Girl is anything but ordinary," she thinks to herself. Meanwhile, after 15 years her husband still looks at her with so much love and appreciation. "My Girl brings a smile to my face. My Girl brightens up my day. My Girl is anything but ordinary," he thinks to himself. For 15 years My Girl still remains the true symbol of love and devotion.